Charles King drove the first car on the streets of Detroit-his design was powered by a four cycle, four cylinder block type, a type that became the industry standard. Henry Ford drove his car 3 months later. On March 6, 1896, 10 years after Carl Benz patented the first gasoline-powered automobile in Germany, and three years after the Duryea Brothers' first vehicle, Charles King became the first driver of a gasoline automobile in Detroit. Everyone knows about Ford's Model T, but Henry Ford was riding a bicycle at the time. Three months before Ford took the wheel, King had his own momentous first drive, a spin that began when he steered his vehicle down St. Antoine Street to Jefferson Avenue, and then swung north on Detroit's famous Woodward Avenue to Grand Boulevard. After that, he turned around and headed home, only to be greeted by a police officer who threatened to ticket him for disturbing the peace. On October 16, 2007, at an impressive ceremony held in Dearborn, Michigan, motorcar pioneer Charles Brady King was inducted into the Automotive Hall of Fame. 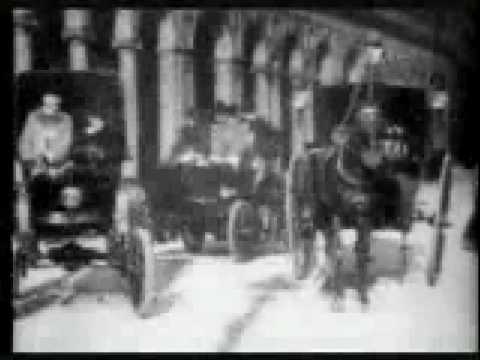 Few have deserved such an honor more than King, who introduced Detroit to the automobile when he drove the first “horseless carriage” on that city’s streets on March 6, 1896. 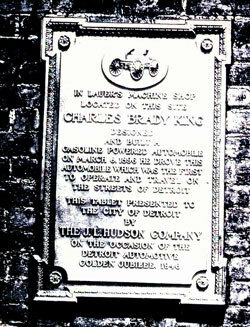 Charles King would play a highly signifi cant role in the development of the American automobile over a period of several decades. However, the man’s talents stretched far beyond that of an automotive designer. King was an inventor, an architect, a painter of considerable repute, and a musician. In brief, he may fairly be called the “renaissance man” of the auto industry!